The simplest way to move everything from an old Mac to a new Mac is to use the built-in Migration Assistant tool. Migration Assistant can be used at any time, but ideally, it will be used on first boot of the new Mac, that way when it’s finished everything on the new machine will be exactly where you left off on the old machine, except all your files, documents, and apps, will be on the new Mac. This is what I recently used to migrate from a failing old MacBook Air to a new MacBook Air (a technically used Certified Refurbished model from Apple), and it allowed me to never miss a beat. If you’ve never used it before we’ll walk through how to do this, as it’s by far the best way to basically duplicate one Mac over to another. Now you only need to wait until the transfer is completed. This may take a while, because everything is copying from the old Mac to the new Mac over the network, meaning if you have a fast wireless-N network it will move quicker than a slower wireless-B network. For this reason, if the machines have ethernet it can be faster to use a wired network, but either way you can expect this process to take a little while, so it’s safe to go occupy yourself with another task for a while. Once finished, the target (new) Mac will reboot and include everything the old Mac had. Literally everything will be the same on the new Mac now, from files stored to apps available, even down to icon arrangement and background pictures. 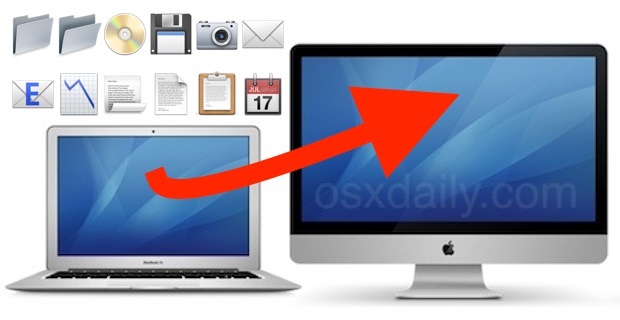 This is by far the easiest way to get every single thing from an older Mac to a new Mac. This is also why it’s a good idea to choose everything during the migration, because it makes it all the more simpler to basically just duplicate a Mac onto another one. Once you have transferred everything to the new Mac, it’s best to run through on the new Mac and double-check that everything is in order. Insure your files are there as expected, and that everything works. It should be fine, but it’s always good to be sure. Don’t worry if you didn’t copy everything over though. If you didn’t select everything to be migrated initially, you can transfer a file or folder later using something like AirDrop or network sharing at any time to get the stuff that was forgotten. Eventually this feature may move to iCloud but for now it’s all handled locally on Macs. On the other hand, iOS users can perform a similar migration of iPhones and iPads with iCloud, or by using iTunes if the former is not available for one reason or another. Whatever your devices, happy migrating! Will this work the same way if you just have a backup from Time Machine? 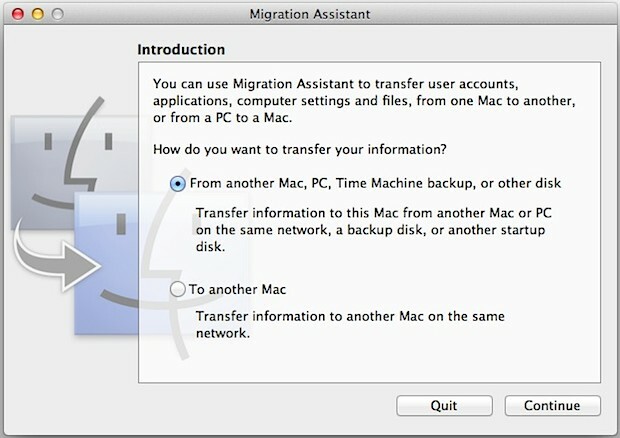 Yes, if you choose the Time Machine option instead when running Migration Assistant. Assuming you have a recent TM backup, too. What if you are upgrading to a later version of OS X, for example from Snow Leopard to Mountain Lion? It mentions “Mac or PC”, this works with Windows in some fashion? Yes it moves My Documents and My Pictures from a PC but I wouldn’t rely on it 100% because its windows after! I actually was a little skeptical of this when I recently purchased my new MBP. I had an early 2008 running Mountain Lion and finally decided to upgrade. I used the migration assistant. It transferred about 230 GB worth of files to my new machine in about 1 1/2 hours. I was amazed at how fast it was. The only two glitches I had were two licenses weren’t transferred, Office 2011 and another app. That was an easy fix. So I highly recommend using migration assistant. My only complaint about Migration Assistant is it’s too complete. I wanted to only transfer certain specific applications and such, and I’m only presented with the option to take all or nothing. Take nothing and redownload only what you need from App Store? Almost none of my applications are from the app store. Besides, I want to pull over the apps AND settings as they were on my old Mac. Especially with Photoshop, I was hoping to avoid having to reload all my plug-ins, actions, key commands, brushes, work spaces, etc. Any tips for transferring files from an old PowerPC iMac to one with an Intel processor? 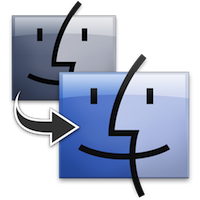 What would be the best way to transfer files to a clean install or new MAC? I suppose my Mac gathered a lot of garbage through the years and I am thinking about a clean install. With the Migration Assistant I fear to copy all this junk as well. What is the best way? Do I just copy the stuff I need manually? Where do I find all the local Mails? What about Apps bought old fashioned online? Yes, exactly. I want to transfer my information from my old mac to a shiny, new OS X installation. I dont want any of the garbage settings, and built up cr@p. I want my old stuff on a fresh install. Suggestions for that other than painstakingly moving library, application support and myriad other files and folders from one to the other? Personally, I just take my documents, pictures, and itunes library, and copy that stuff manually to a brand new Mac. Then I go and redownload and reinstall the apps I want. That way you dont carry around legacy stuff you may not need anymore, but you keep all your documents. Would it be possible to hardwire the old Mac to the new Mac before using Migration Assistant? And if so what type cable would one use to connect the two Macs? As a tech who has done thousands of Mac setups in corporations over the decades, I know about Migration Assistant. It does a decent job – but as others have mentioned, it will bring over a lot of the old junk from the old system. It does not do any compatibility testing on if your apps will work or not or how old your fonts are or if your preferences are corrupt or not. And when it does this, you get a system that is not quite as buggy as the old Mac, but nowhere near as stable as a clean install of the OS and clean installs of the apps. My best suggestion for those of you interested in a stable system you don’t have to worry about is to avoid Migration Assistant. You are better off doing a clean install of the applications and moving over your files by hand. It is not too tough if you keep everything in the documents folder and desktop – those are two folders in your Users/ folder. Also grab the iPhoto and iTunes libraries (and Garage Band and iMovie files too if you have them). Move your fonts over and add them in through Font Book (included in the Applications folder) and be sure to scan them for damage or corruption. You can export your bookmarks from Safari or any other browser you use and reimport them again. Install a new printer driver – they tend to be OS specific. 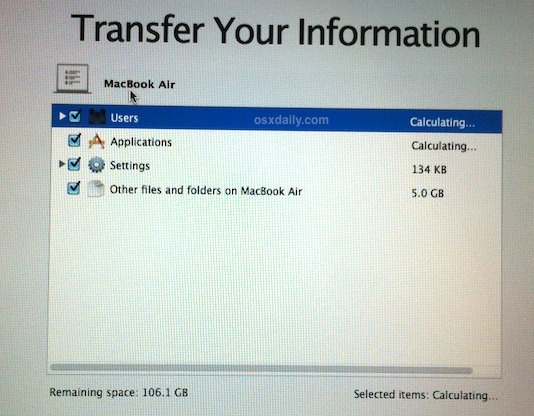 Your mileage may vary, but this should cover most generic users needing to move to a new Mac. Getting a new Mac is a great opportunity to get a fresh start – like moving into a new house. Wouldn’t it be better to put new furniture into the new house rather than bring over the dirty old stuff you had before? To answer the “what cable do I use” question by Dave – you can use a Firewire 400 or 800 or a standard Ethernet cable to go directly between the two systems – it depends on what each one has, but you should be able to find a match. If you want to use the network option, don’t use wireless or go through a 10/100 mini-hub – your Mac (old and new) will be able to support gigabit ethernet speeds when using a direct ethernet cable going from Mac to Mac, speeding up the transfer by hours. You don’t even need a special crossover cable – a regular Ethernet cable will work. There should be no issues sharing the same Apple ID between multiple Macs, and you shouldn’t need to uninstall apps from the old Mac at all. Have fun! Half the fun of a new computer is an excuse to start over fresh. You end up loading up stuff you need and nothing else. I can’t imagine getting a brand new computer and then transferring all the crap I’ve built up that made me want a new one in the first place. Is it possible to have two users migrate from two separate computers down to a new computer? I’m thinking yes just with two separate user accounts sharing the same applications. Just copy over their own user directories manually starting fresh with apps of after one user does the migration assistant. Does the new macbook pro need to be cleared first? I’m moving from an older MBP to a MBP Retina because I’m now using an IMac 27 inch Retina. So the MBP Retina has my old system that was move to the IMac. Do applications like Microsoft office etc get transferred? Thanks!